The center of our galaxy is less than 30,000 light years away, but it is notoriously difficult to observe. Because of the gas and dust surrounding the region it can’t be seen directly at visible wavelengths. Instead we have to observe at infrared or radio wavelengths, where the surrounding gas and dust is more transparent. Even then it can be difficult to get high resolution images, particularly at radio wavelengths. But recent upgrades to the Jansky Very Large Array have produced some incredible radio images of the galactic center, such as the image above. This particular image shows a 100 light-year wide around galactic center. The supermassive black hole at the heart of our galaxy is in the middle of the bright region. What’s amazing about this image is how much structure we can see. The dynamic range of these new images is 100,000:1, which is a big improvement over the images we’ve had. 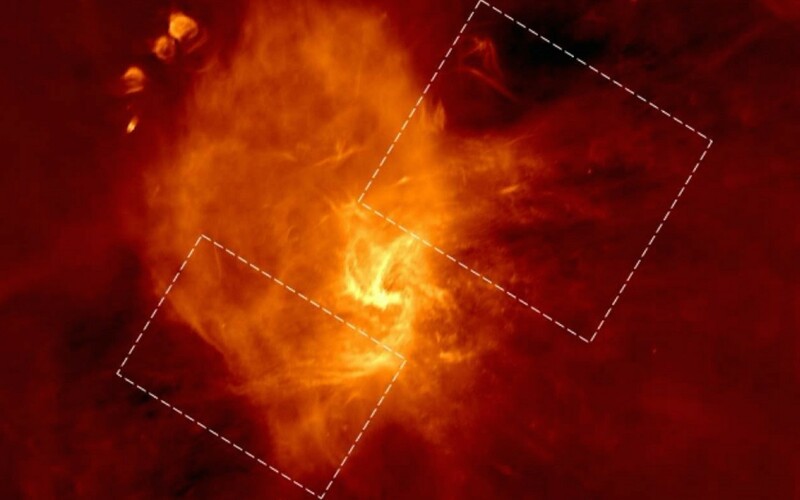 You can see the mini-spiral structure surrounding the supermassive black hole, which is an interesting find. Clearly there are some complex interactions in the region. Analysis of this and other images have already found evidence of a supernova remnant, as well as evidence of gas and dust motion that may be driven by bright star clusters. The data is still young, and it’s clear we still have a great deal to learn about the heart of our galaxy.